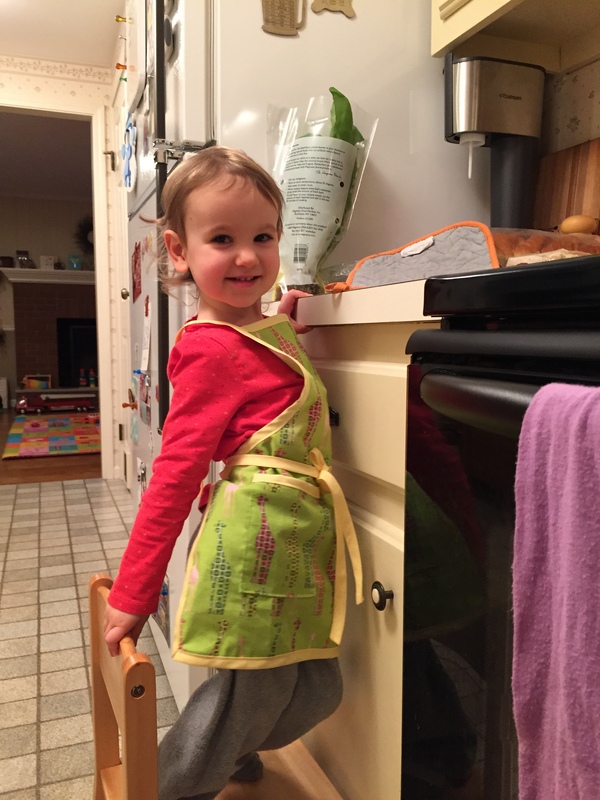 As I was cooking dinner the other day, Julia enthusiastically said, as she was pushing her little chair towards the counter “Can I help you cook?”. “Sure!”, I answered. I was making veggie burgers. She helped me mix the mayo with the pesto and then she spread the pesto mayo on the buns. 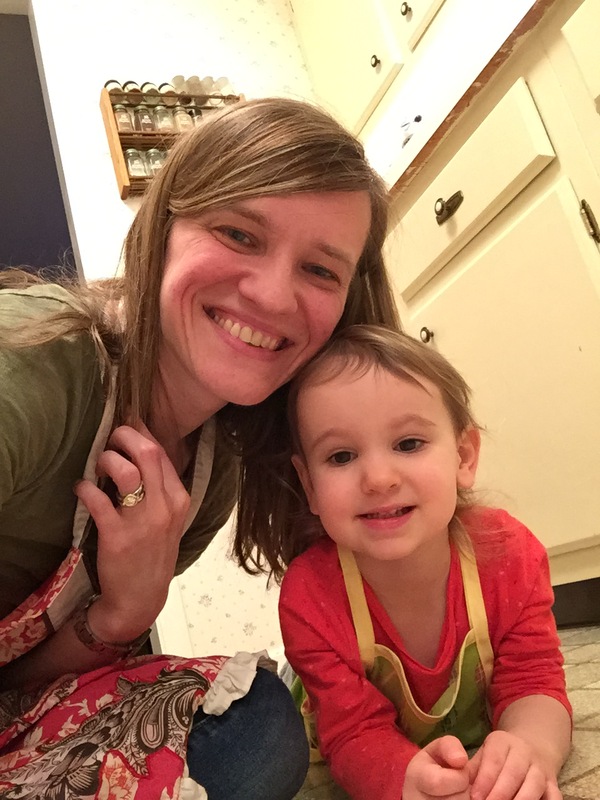 She also helped me add the cheese slices, the avocado slices, and the tomato slices on the veggie burgers. It was a good first dish to help with and she was very proud. She ate half of the veggie burger, which is a lot for her. The next day she asked to help me cook again. 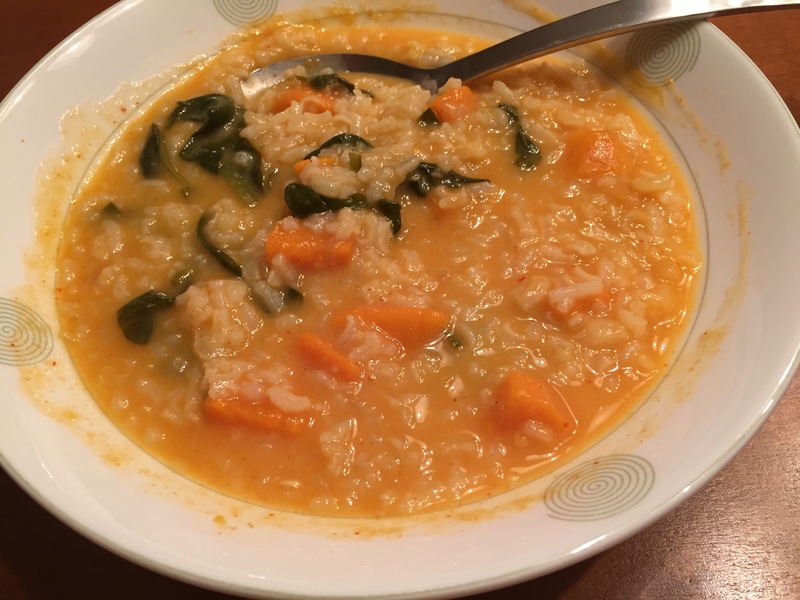 This time I was cooking a curry soup from the Isa Does It cookbook. I showed her how to chop the onion, garlic, and ginger. When the oil was warm, we added the onion and sauteed it until soft. We added the garlic and ginger and cooked it a bit more. The next required ingredient was rice. 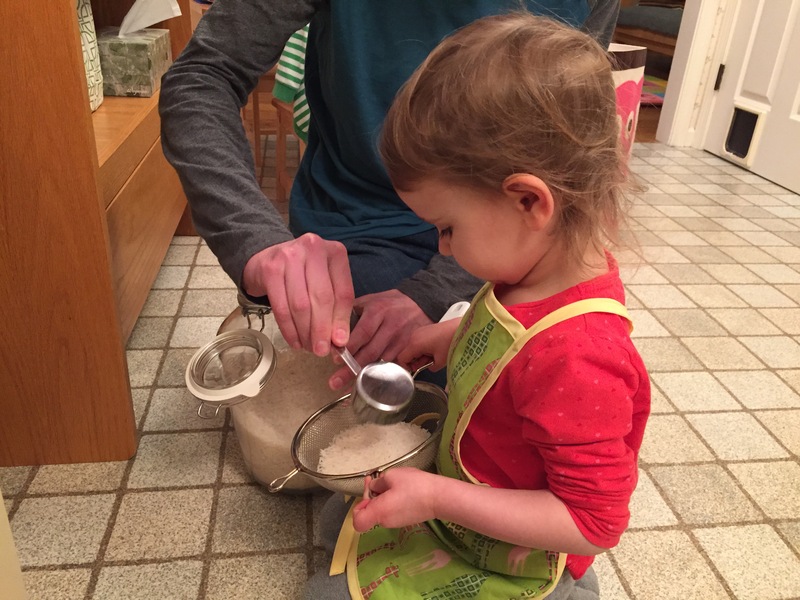 Joel helped her scoop the rice into the strainer and then we rinsed it. We then added the broth and the rinsed rice and she helped me stir. Once boiling, we added the curry paste and the cubed sweet potatoes. 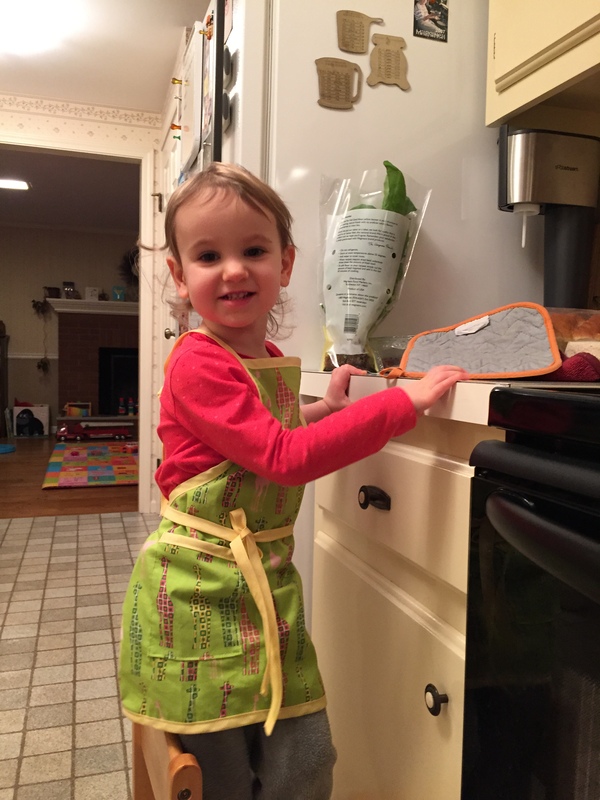 When the soup was almost done, she helped me add the spinach leaves. She loved this part… she loved grabbing the leaves and placing them in the pot. I let her do it a few times, since she grabbed small bunches. I have a thing for gnocchi. I have had it for a long time. Soft pillowy melt in your mouth goodness… yum!! I have never had the guts to make them from scratch. I usually buy the Gina Italian Village Potato Gnocchi, which are pretty good. But whenever I go out to a restaurant and they offer home made gnocchi, they taste so much better. My favorite have been at Good Luck, as I mentioned in a previous post. A long time ago, my friend Karen, who is a super cook, invited me over for gnocchi. 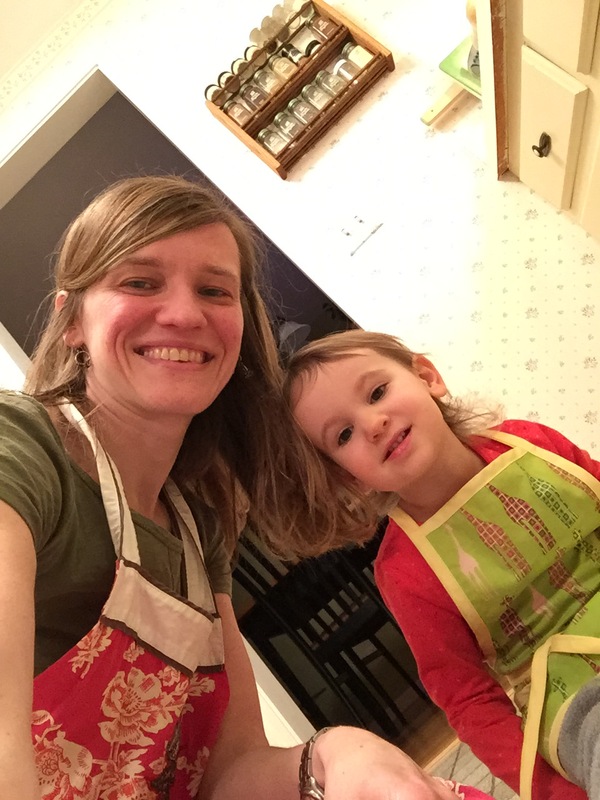 She shared her trusted recipe and showed me how to make them. The process was not very difficult, but it was time consuming. Her gnocchi were super tasty! She sent me home with the recipe, which I filed in my binder and thought about it every time I made the store bought gnocchi. 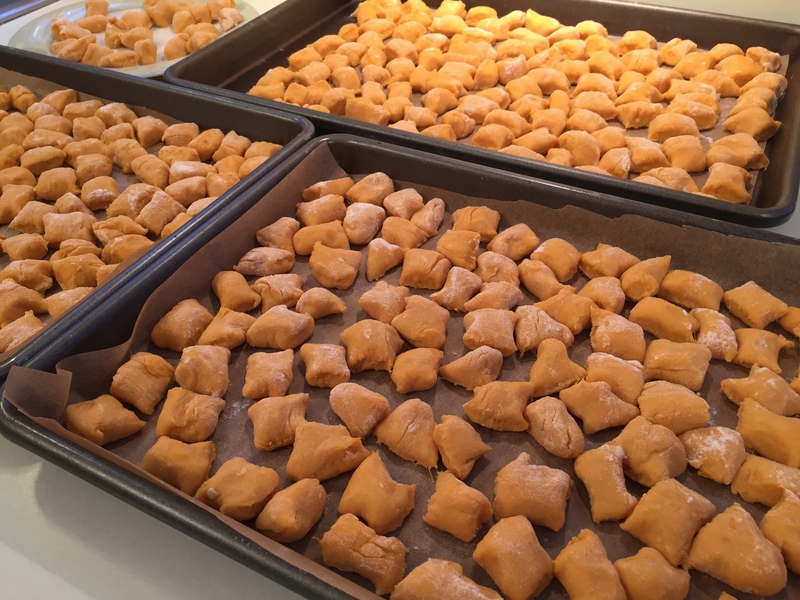 While browsing my new cookbook, Isa Does It, I found a recipe for a sweet potato gnocchi. After reading it, it did not seem too difficult and she mentioned that the total hands on time was 30 minutes. “Ooo! That is not too bad!”, I thought. Since my birthday was this past weekend, I decided to make them for my birthday dinner with my parents. 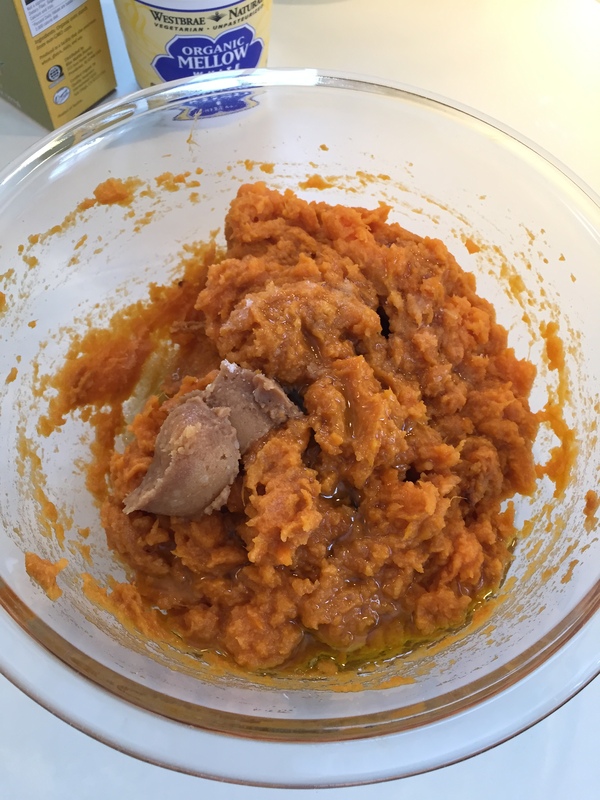 What I liked about the recipe is that you roast the sweet potatoes. Also, peeling the roasted potatoes is super simple. Once your potatoes are roasted and peeled, you mash them and then add miso, olive oil, salt, corn starch, and flour. 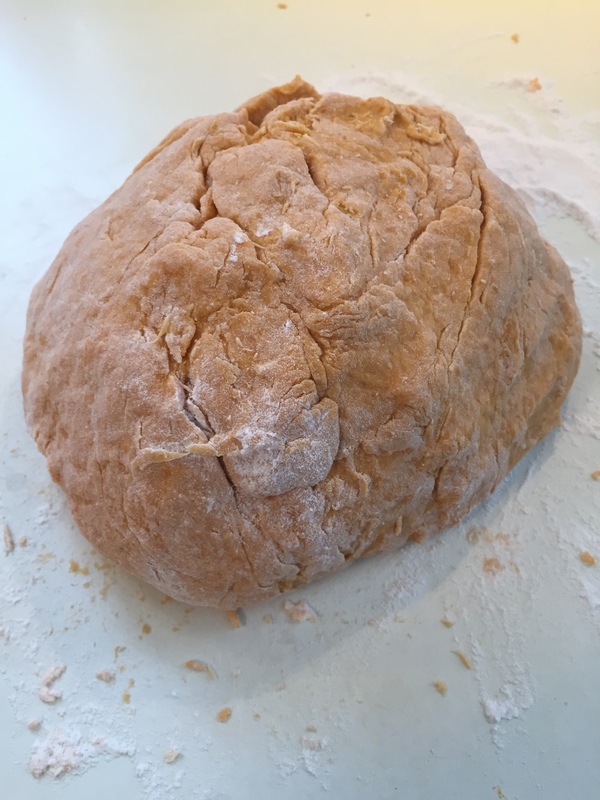 The recipe required 1 1/2 cups of flour and noted that the dough should not be sticky. I found myself adding a bunch more flour since my dough was super sticky. Not sure why that was. I think that in the end, I used an extra 1/2 cup or more of flour. It was still a bit sticky in spots, but it was manageable. 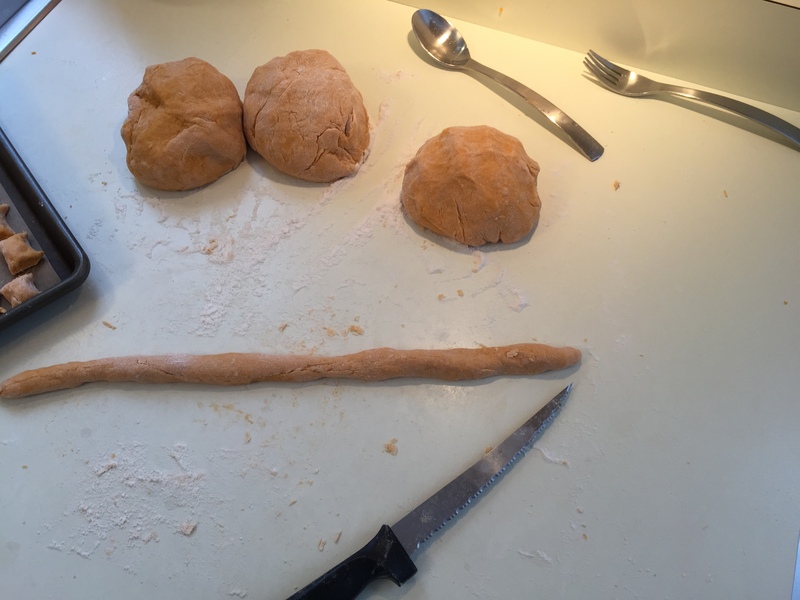 Once the dough was at the desired consistency, I removed the dough from the bowl and sectioned it into smaller rounds, rolled the rounds into strips, and then cut little pillows. Rolling the dough was a bit tricky since it was somewhat soft. I found myself rolling some of the strips between my palms instead of on the counter. 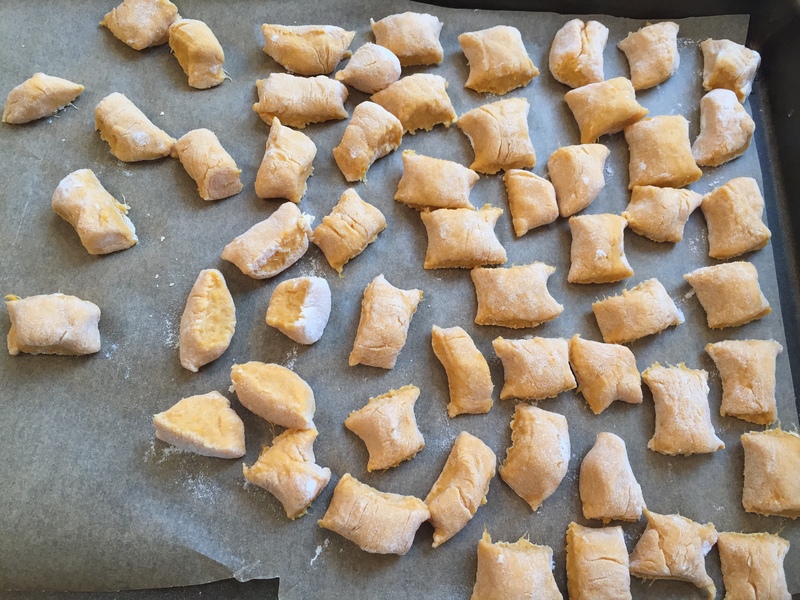 Also, as suggested, I tried to score the pillows using a fork so they resembled the traditional gnocchi, but was unsuccessful. The pillows were soft, so perhaps that was the reason. I doubled the recipe since I wanted some leftovers, so I ended up with a lot of gnocchi. Since I doubled the recipe, it did take me longer than 30 minutes to make them. Cooking them was very quick. Just like any fresh pasta, you only cook them for a few minutes and once they raise to the top, you can drain them. I removed them using a slotted spoon as suggested. I was afraid to drain them in a colander, thinking that they might stick or fall apart. The recipe also included a creamy tarragon sauce with brussles sprouts. Instead of cooking the brussels sprouts in a pan, as required, I decided to roast them, since it is simpler and I love roasted brussels sprouts. A vegan cuisine basic seems to be soaked cashews. Apparently it is used in a lot of sauces and soups. It gives the dish the creamy consistency and it is also a thickener. I decided to use coconut milk instead, since I did not have enough cashews and forgot to buy more. For the sauce you sauté some onion and garlic and then add some white wine and cook it until the alcohol evaporates. Next you add the chopped tarragon and cashew mixture (this is where I added the coconut milk). Since coconut milk is fairly liquidy, I made a little roux and added it to the sauce, which thickened it nicely. 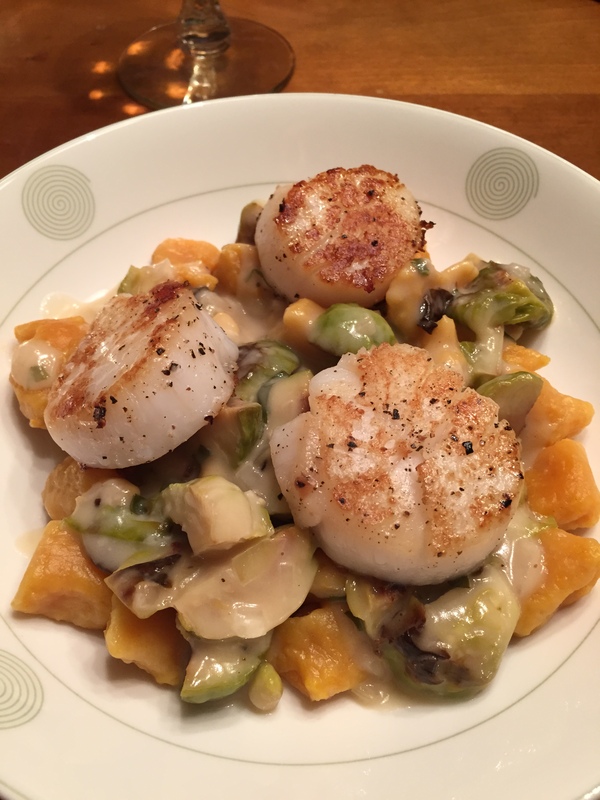 I finished the dish with some pan-seared scallops, since I was in the mood for some fish/seafood. The dish was tasty. It looked really pretty! I found that both the gnocchi and the sauce were pretty mildly flavored. I wonder if the cashews would have added a little more substance to the sauce. I think that next time I will add some (ignore if you are vegan!) prosciutto or pancetta to the dish. Some sprinkled Parmesan cheese would also be a very nice touch. Nonetheless, I was pleased with my dinner. And, my mom made my favorite birthday cake, which completed the dinner. Dilly stew… how can you resist that?!? And dumplings… really?!? While spending an evening at our friends Amy and Richard’s house, I was eying their cookbooks. They are vegan and I have always had an interest in it. Looking at my cooking you might say that I do steer towards it, since I am lactose intolerant so I stay away from dairy, do not eat much meat, and eat lots of fruits and veggies. But I am definitely not vegan and it is highly unlikely that I will go there. I have a love relationship with prosciutto and desserts, which usually include eggs. Their collection of cookbooks included Isa Does It: Amazingly Easy, Wildly Delicious Vegan Recipes for Every Day of the Week by Isa Chandra Moskowitz. While browsing the cookbook, I found a bunch of dishes that sounded really good, one of them being the dilly stew. I took a photo of the recipe and was excited to make it. Then a few days later I was opening a gift by the Christmas tree and lo and behold it was the Isa cookbook! Joel bought it for me. I was super excited! I browsed the cookbook again, admiring all the photos and recipes, and I decided to still make the stew as a first try. The recipe is pretty simple. The hardest part, and it is not really that hard, is chopping all the veggies. The dish requires your basics, onion and garlic, and a bunch of veggies such as potatoes, carrots, and celery. I had some sweet potatoes, which Julia loves, so I decided to swap for a few of the regular potatoes. 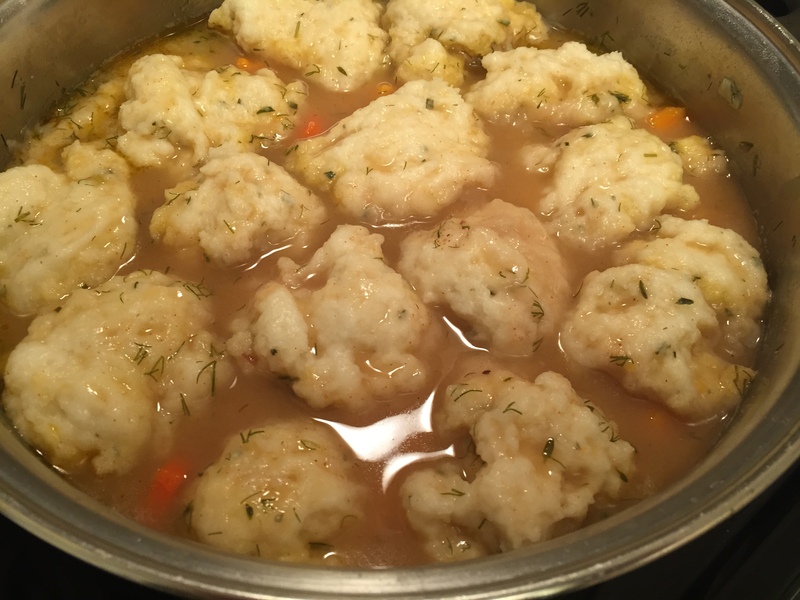 The dish also requires beans and a few fresh herbs such as dill, thyme, and rosemary (for the dumplings). To start, you have to make a roux by adding some olive oil and flour. She mentions using a wooden spoon to mix it. I decided to use a whisk, since I have made a roux before and worked really well. The annoying part of making a roux is that it can clump. Using a whisk mitigates that risk. Once your roux is made you add the onions (I used shallots) and cook them a bit. Then you add the garlic and after a few minutes the broth (I used the Better Than Bouillon chicken, which I love) in a slow stream to prevent any additional clumps. You then add all the veggies and simmer them until soft. The dumplings where the easiest in the world! You simply add some flour in a bowl and mix some salt, baking powder, and chopped rosemary. You then make a well in the center and add some milk (I used coconut milk) and olive oil and mix it until it comes together. Once the veggies are soft, you simply drop spoonfuls of the dough into the pot, cover it, and simmer everything for about 15 minutes. That’s it! I really liked the dish, especially the dumplings. They definitely make the dish. 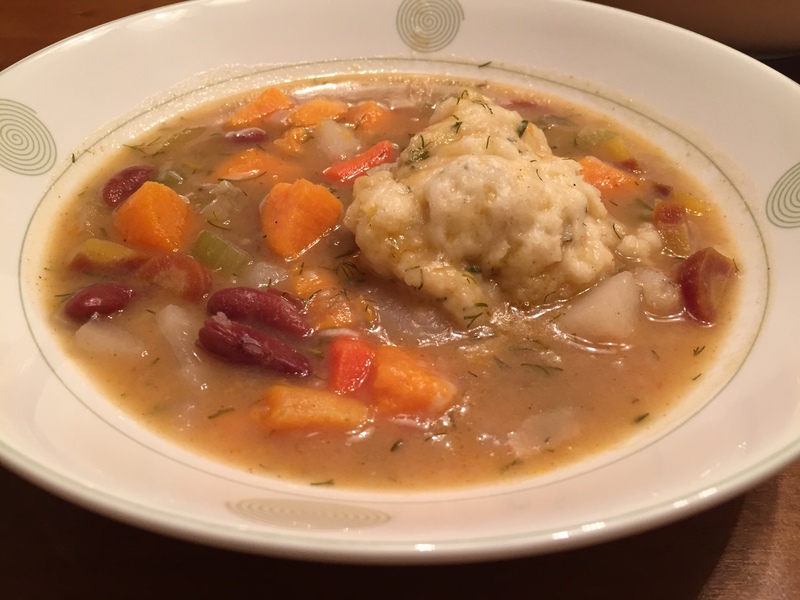 The best part about it is that you can experiment with different veggies for the stew and different herbs for the dumplings. I love new cookbooks! Especially ones that include tons of photos… I find them more inspiring. I really want to make every dish in this cookbook! Although the cookbook includes vegan recipes, you can easily substitute or add non-vegan items such as chicken broth, dairy, meats, etc. If anything, I feel like the recipes give you a good base for adding more veggies to your everyday meals. In addition, the recipes seem simple and do not require strange ingredients that you will only use once. In fact, I noticed that multiple recipes include the same ingredients, which is fantastic! Julia turned 2 the other day. Crazy!! I cannot believe that she is already 2 and at the same time it is hard to believe that she is only 2. Ha! We had a small birthday party to celebrate her birthday. Since one of Julia’s friends is vegan, I decided to make a vegan cake. I looked in a few cookbooks and at a few sites and decided to give it a try. The recipes did not seem too involved, so how hard can it be. Another ha! I baked 5 cakes… yes, I said 5 cakes… and they were either ok, mediocre, or just awful. The first recipe that I tried was a coconut lemon cake from the Veganomicon cookbook. It was simple to make. The recipe included coconut milk, lemon juice and zest, and the regular baking items, such as flour, sugar, etc. Since no eggs are included, a combination of baking powder, baking soda, and apple cider vinegar is used as a replacement. The recipe required a bundt cake pan, but I decided to make it in a springform pan. The cake was pretty good, but it was not a good cake for a birthday cake. The flavor was really nice… the coconut and lemon worked well together. The consistency of the cake was pretty dense… it almost resembled corn bread. 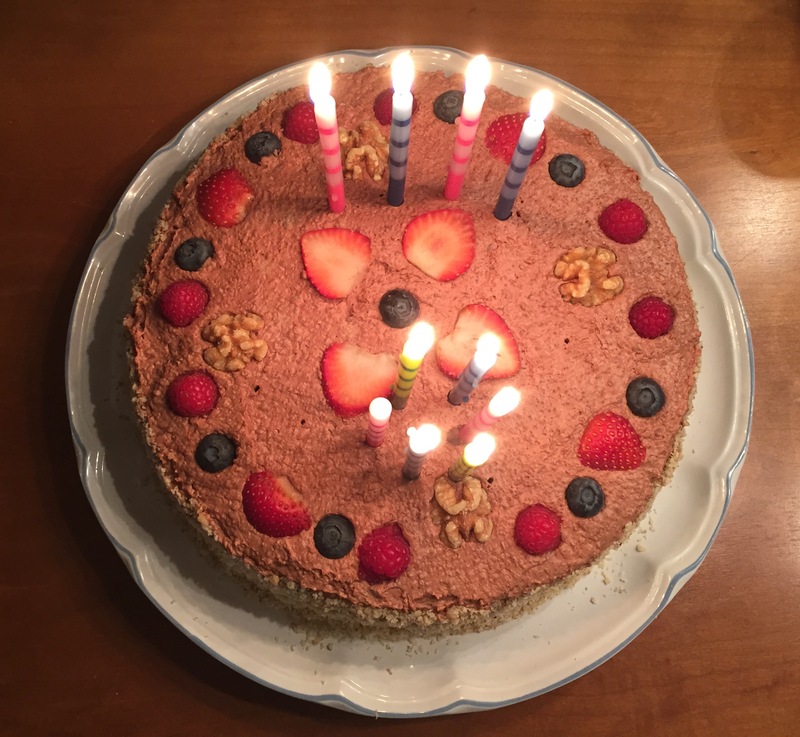 Joel tried to convince me that it was an ok recipe as a birthday cake, but I was not convinced. I searched some more and I came across a recipe for an orange blossom sesame cake on the My New Roots blog. It sounded pretty tasty. However, there were a few things… the recipe required unhulled sesame seeds and tahini made from unhulled sesame seeds. I am not sure where you can find tahini from unhulled sesame seeds. Wegmans does not carry it… perhaps Lori’s or the co-op? I did not have time to search around too much so I settled on the tahini that I had in my fridge. Same goes for the sesame seeds. The recipe also required orange blossom water. I again searched at Wegmans but could not find it there. I did find it at Cook’s World… I love that place… they have everything there! :) The recipe was also fairly simple to make. The cake looked somewhat similar to the photo in the blog. My version was lighter, which I suspect is from the fact that I used hulled sesame seeds and tahini. I really liked the cake. The flavor was nice. I liked the taste of the tahini with the orange flavor. I did not care too much for the honey syrup… I found it way too sweet. If I make the cake again, I would make a simple syrup instead. Even though the cake was good, again I did not think that it was a good cake for a birthday party for a 2 year old. The search continued. I decided to look in my Moosewood Restaurant Book of Desserts cookbook. I forgot that I owned this cookbook and thought for sure that a vegan recipe would be included. I was right… but it was a chocolate cake. I was set on making a vanilla type of a cake, since chocolate seems to affect Julia. I thought I would give it a try anyway. 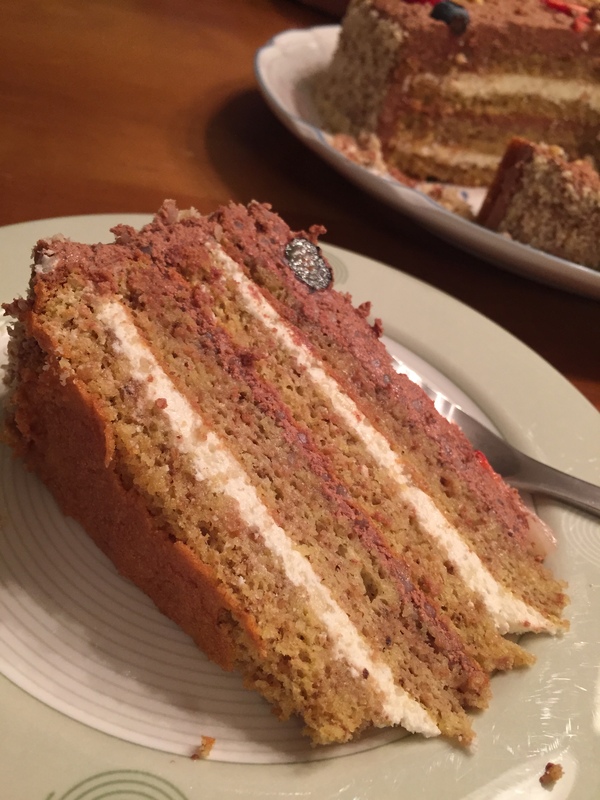 The recipe is the simplest cake recipe I have ever made. It takes 12 minutes if you want to use a bowl. According to the recipe, you can mix everything in the pan, which would only take you 6 minutes to make… hence the name of the recipe “Six-Minute Vegan Chocolate Cake“. The cake looked pretty good… it looked rich and fluffy. However, the flavor was much subtle, specifically the chocolate part… it was pretty mild. The recipe only required 1/3 of a cup of cacao, so I am not surprised. Aside, from that, I did not really like it as a cake. Again, it needed more chocolate. The last recipe that I tried was a recipe that I found on AllRecipes.com called Vegan Basic Vanilla Cake. I have never made anything that was posted on that site, but 23 people gave it a 4 1/2 star. So it must be a good recipe, I thought. The recipe required the same basic ingredients that all vegan recipes require and it was pretty easy to make. The outcome, however, was not good. The cake was gummy tasting and just blah. I am so surprised that 23 people gave it such a high rating. I must be missing something. Or I must have high cake standards. It is definitely NOT a keeper. 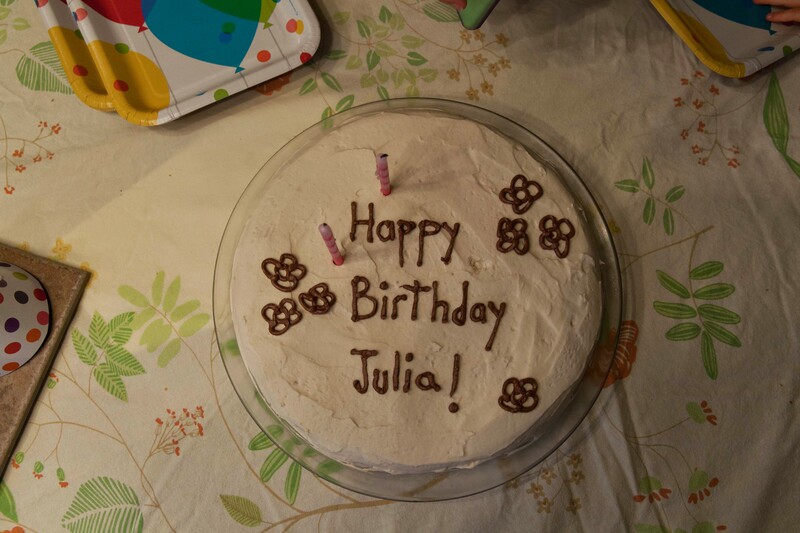 In the end, I ended up making a regular sponge cake with lemon curd and vanilla frosting for Julia’s birthday. Since I felt terrible about not having a cake for Julia’s friend, I made the Six-Minute Vegan Chocolate Cake recipe as cupcakes. I must admit that I really liked the recipe as cupcakes. I think that it worked way better than baked in a springform pan. I am not sure if it is because the muffin pan requires less cake so it bakes differently or what. The flavor seemed more intense too. I am not sure what to make of vegan baking. The egg replacement is a mystery to me. I admit that I have not tried the egg replacements that exist, but I did not want to buy another ingredient that I will only use once or maybe never, depending on the outcome. I have had some really tasty vegan cakes so I know that a good recipe exists. I guess I just have not found it yet.